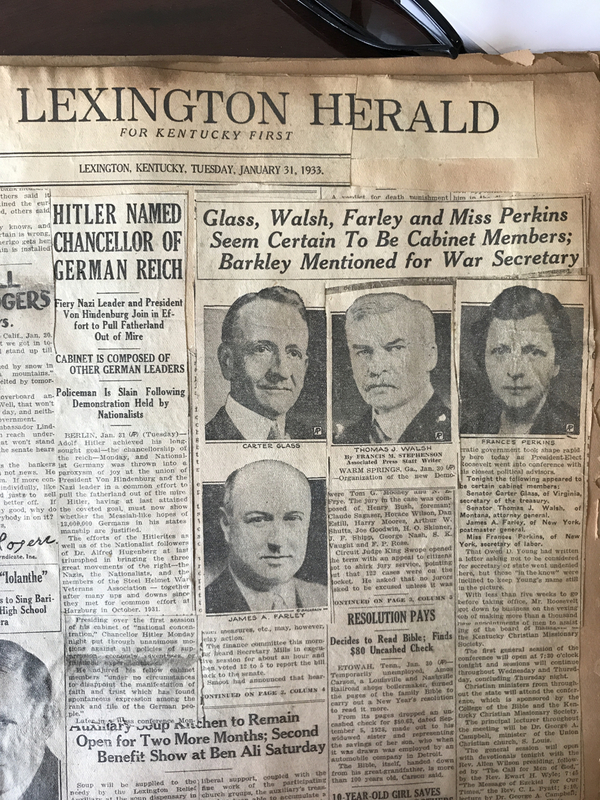 In the fall of 1929, the family of Will and Sarah Howe Salyers was getting settled in Lexington, Ky., after moving there from Richmond. 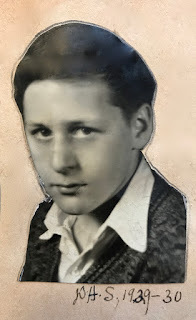 The baby of the family, David Hillis Salyers II, enrolled in the 9th grade at Morton Junior High School. Tidbits in his mother's scrapbooks show that he was an above-average student, making As, Bs, and the occasional C. However, he excelled in basketball and in all things musical. As during his younger years in his home town of Carrollton, he was an active Boy Scout. I'm not sure when this troop photo (below) was taken, but I believe David stayed in scouting through at least part of high school. 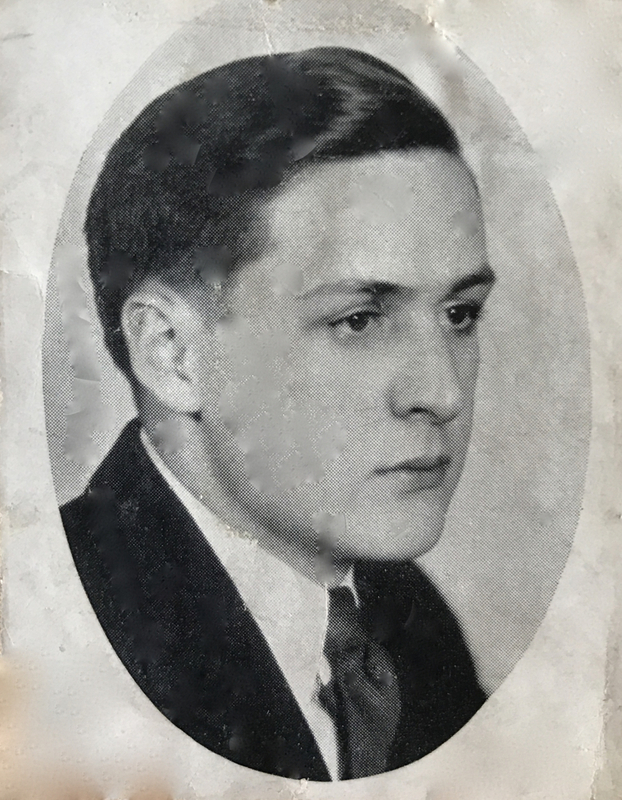 In January 1930, he graduated from Morton. I don't understand the timing, graduating in January instead of the traditional May or June, but maybe junior high schools, like colleges, offered that option. 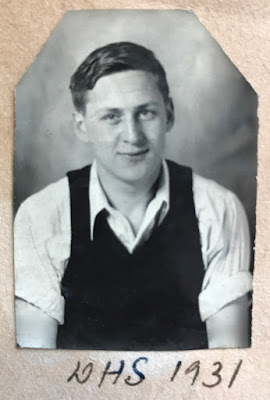 Whatever the case, I'm touched by the congratulations he received from his oldest brother Bob, who was working in Joliet, Illinois, and his father, who was still a regional salesman and away from home most of the time. 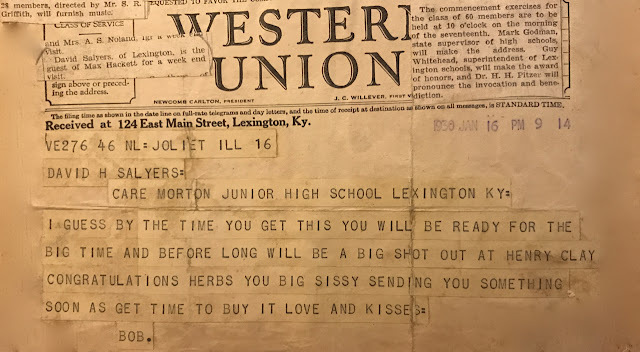 In a telegram sent the day before graduation ceremonies, Bob teased his little brother (they were eight years apart in age) and called him by his nickname, "Herbs." I have no idea of the source of that nickname, but David was known in the family as "Little Herbs" and his dad "Big Herbs." Note the two newspaper clippings pasted over the heading of the telegram. 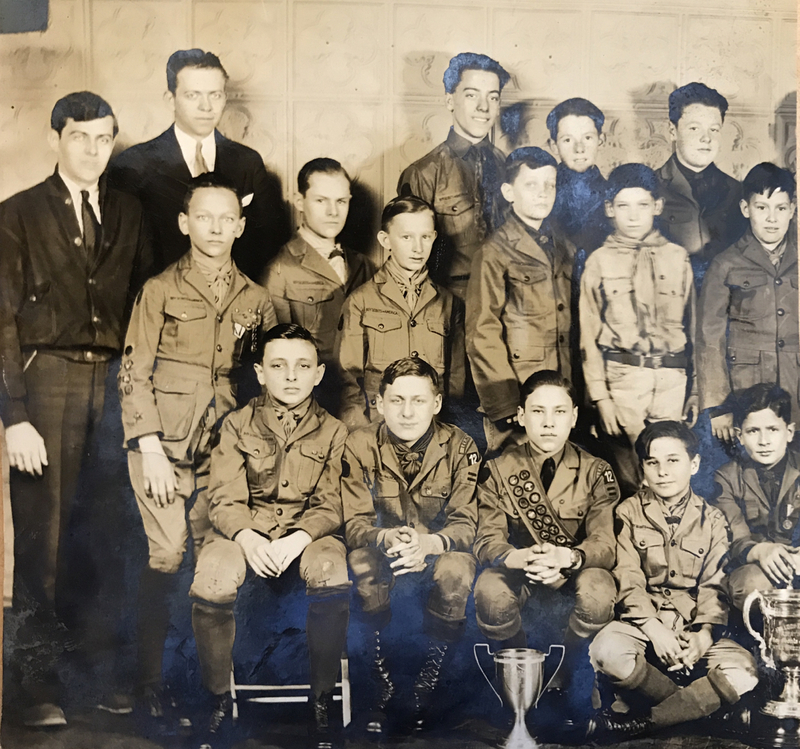 The one on the right tells us that David was one of 60 students to graduate from Morton Junior High in ceremonies held on Jan. 17 (1930). The one on the left refers to a trip David made to Richmond to spend a weekend with friends he had made during two years at Madison Junior High. In a letter (below) dated three days after commencement, Will Salyers tells his son that he learned the news of his graduation via an article in the Louisville Courier-Journal. I struggle with that. Surely Will knew his son was about to complete junior high! Surely Will, like Bob, was teasing. How like a typical dad he was, advising his son to study hard in high school and go out for the basketball team. 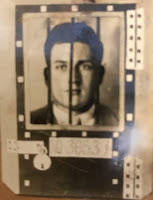 I haven't been able to determine if David enrolled at Henry Clay High in January 1930 or not until the following fall. Either way, he apparently did well in his school work. The scrapbooks show a few report cards, basketball schedules, and other memorabilia. His 10th-grade school photo is a family favorite. By his senior year, 1932-33, he is well known for his work in Scouting, his writing in the student newspaper (a Salyers family tradition), and his baritone singing voice. He had performed in leading rolls in several church, community, and school concerts and operettas when, in February 1933, he tackled his most challenging role, the lead in Henry Clay High School's production of Gilbert and Sullivan's "Iolanthe." To say the family was proud of him understates the case. I've found copies of the operetta photos, programs, and publicity articles in at least four scrapbooks! 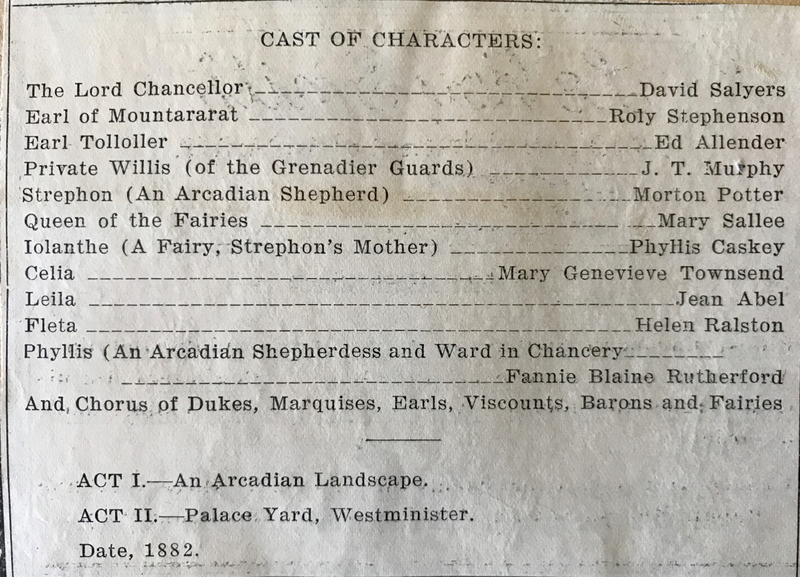 David H. Salyers II (center, in a long, curled wig) starring in a Gilbert & Sullivan operetta. Before the performance, the Lexington Herald-Leader carried two articles about the production and it's star. 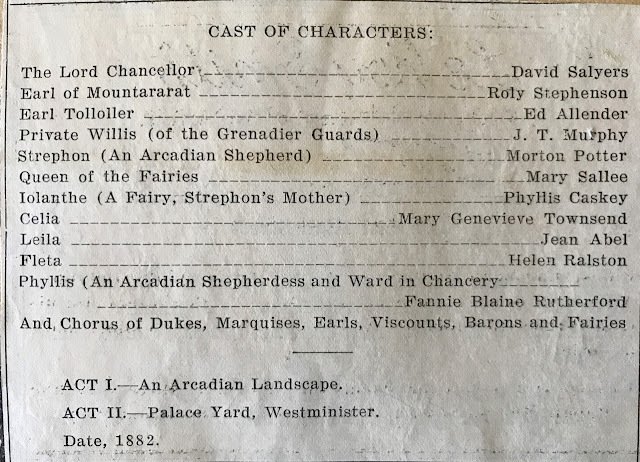 This one (on right) features the student in the lead role. Other articles from the same issue (see below) give us insight into the times. At first I thought the "Iolanthe" article was on the front page of the newspaper. After another look, I realized that someone (probably David's mother Sarah Eva Howe Salyers) clipped articles and designed a front page to feature her youngest son. Misleading – but clever! 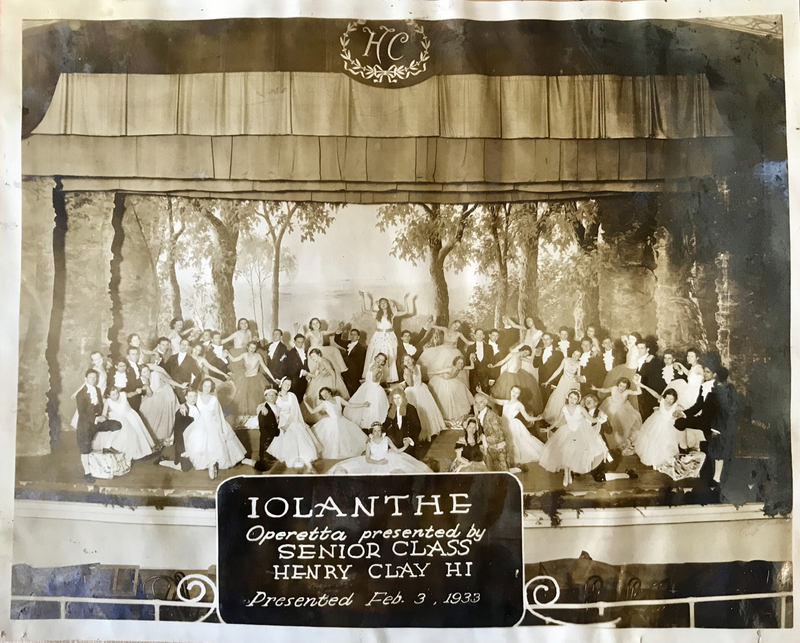 In the spring of 1933, David received a diploma from Henry Clay High. His senior picture (left) shows him as a serious young man, ready to move on to the University of Kentucky. Based on the posts about his older siblings, you can probably guess some of his activities on campus. We'll take a look at specifics in a future post. And yes, I think I see sadness in those eyes. Some of us who knew him wonder if that could be a sign of the "twinless twin" factor discussed in a previous post. There's no way of knowing now, but I long to go back in time and talk with him about it. In the next post we'll follow David as he follows his siblings' footsteps to become a student at the University of Kentucky. David (or his mother; it's unclear who was doing the scrapbooking at that point) saved many pieces of memorabilia about life as a freshman. After that, we may take a little break and then shift gears, returning to hometown Carrollton and Sarah's childhood. 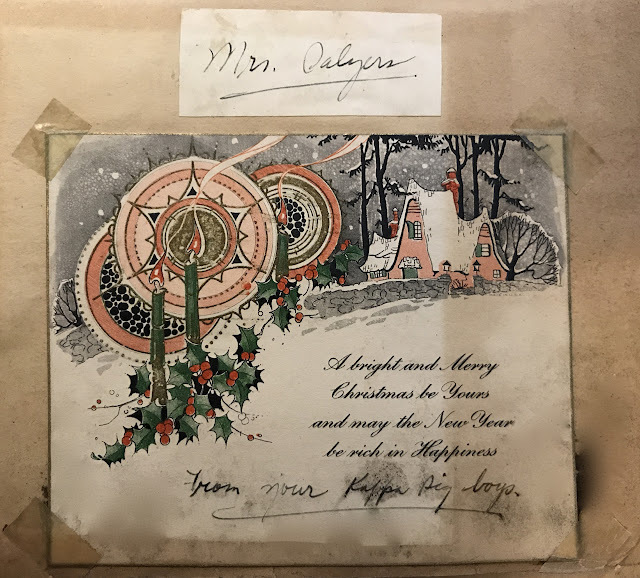 I've just returned from visiting Howe-Salyers descendant Al Hays (son of Sarah's daughter Mary Alice), who blessed me with two stacks of 12x12 pages filled with childhood memories as Sarah recalled them and wrote about them circa 1940. This is the equivalent of two more scrapbooks of family and Carrollton history! Just glancing at a few of the pages, I can advise readers that if they had ancestors in Carrollton as early as 1890, those ancestors' names just might be in this manuscript. Stay tuned! 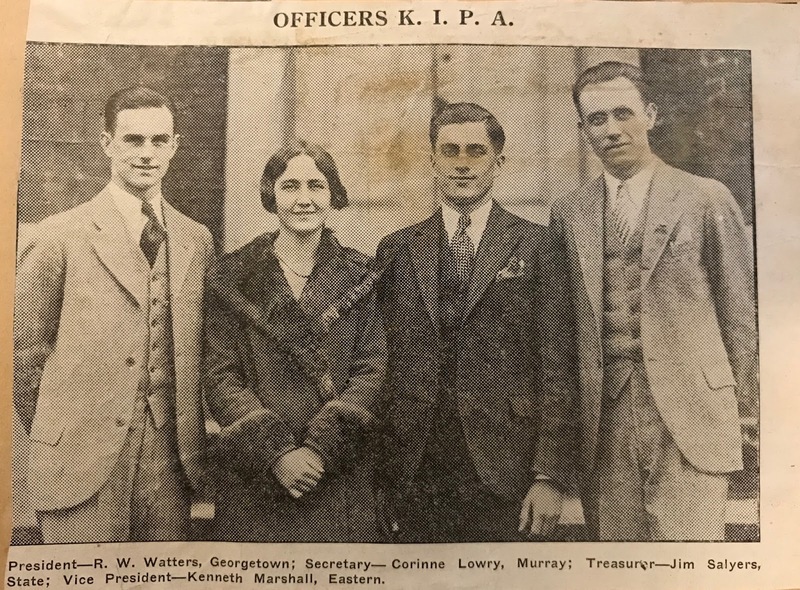 Before I launch into stories of student life at the University of Kentucky in the 1930s, let me add new information to last week's post about the Salyers family's time in Richmond (1927-1929). It's true that the scrapbooks don't tell us much about the Madison High senior year of twins Mary Alice and Jim. I commented that, because they were new in the school, maybe they just focused on their classwork. Wrong! I recently received new info by mail. Mary Alice's son sent materials about his mother's senior year. She was on the school's debate team, which made the final round in state competition in1927-28. She also was elected treasurer of the senior class. She must have made quite an impression on her new classmates, most of whom hadn't met her until school started. In fact, her son recalls that she considered her senior year "a special time in her life." Also, I learned that Jim was on the high school basketball team. The Madison High Royal Purples won the 25th district championship that year and advanced to a regional tournament but did not advance to state-level competition. Now on to their time at UK. Mary Alice and Jim were sophomores when they transferred from Eastern to the University of Kentucky in the fall of 1929. Much of the memorabilia they saved in scrapbooks during their UK years pertain to their fraternity/sorority activities. 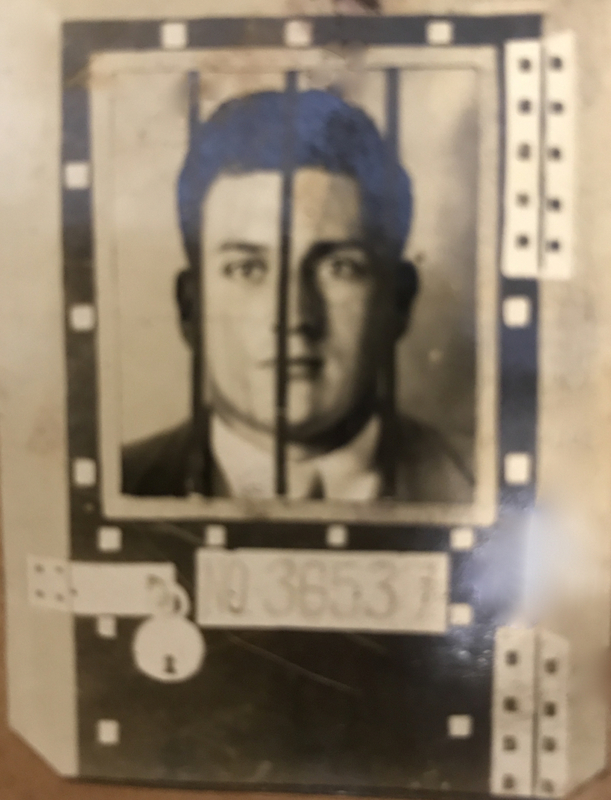 One of the first surprises was a picture of Jim behind bars! A clipping from a Kappa Sigma magazine explained: On Jan. 11, 1930, UK's Beta Nu chapter hosted a "Jail-House Dance" at the Lafayette Hotel in downtown Lexington. 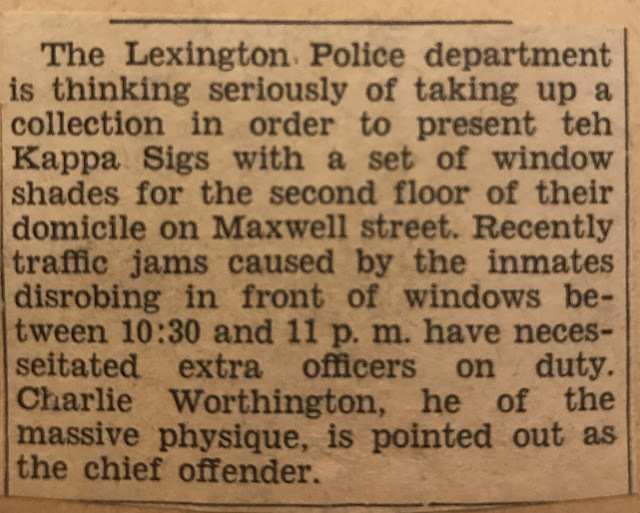 The band dressed in prison garb, and couples rode to the dance in Lexington Police Department patrol wagons. 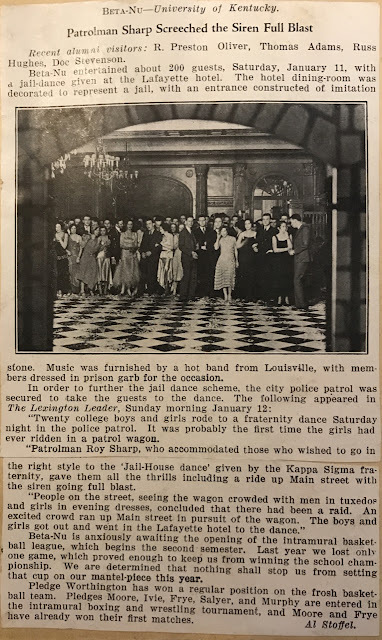 Mary Alice's sorority, Kappa Delta, hosted dances at the Phoenix. This article, publication unidentified, describes a Valentine-themed formal event on February 14, 1930 or 1931. Mary Alice is listed as by the surname "Sawyer." Those of us with the Salyers surname have learned to live with misinterpretations and misspellings of the name. 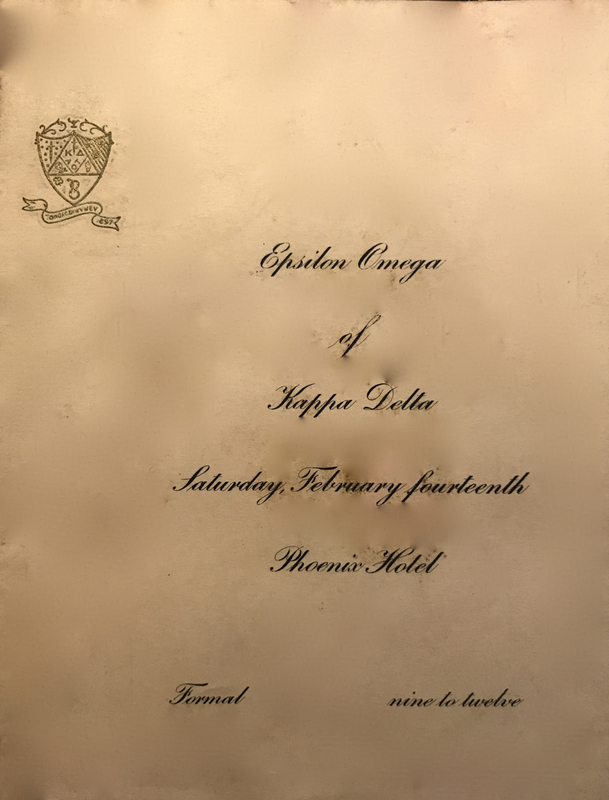 The scrapbooks have many printed invitations and other ephemera about formal dances, teas, initiations, and ceremonies. I speculate that this image shows Mary Alice dressed up for one of those sorority events – or maybe for a fraternity dance. 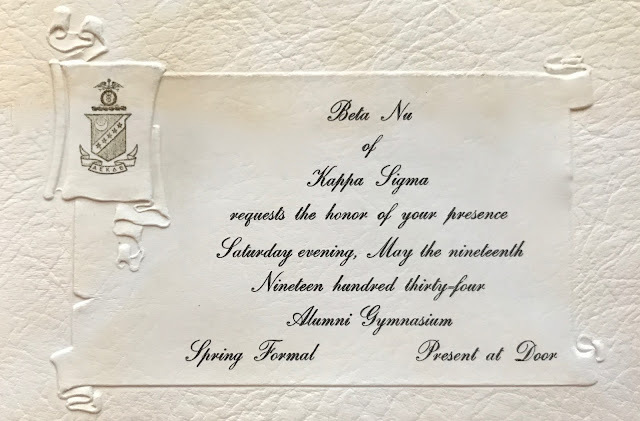 I did see at least one Lambda Chi Alpha dance invitation in her scrapbooks. I'm surprised and disappointed that so far the scrapbooks haven't yielded more memories about their time in college. It could be that everybody was too busy with classes, fraternity/sorority, and part-time jobs to keep scrapbooks! Sarah created a few scrapbooks during that time, so they may provide some stories I can share in the future. In the meantime, please scroll down for a few tidbits pertaining to Jim's fraternity. We'll get back to early 1930s Greek life if and when I come across more information. I'm finding that the scrapbooks are becoming less year-specific, so details about their time at UK could pop up anywhere! Last, a bit of humor. I don't know what newspaper published this story (probably a campus or fraternity paper), and I don't know why the address above differs from the story's mention of the Kappa Sigma house being on Maxwell Street. Coming soon: A look at high school life in the early 1930s as the youngest Salyers makes a name for himself at Henry Clay High. While most students leave their parents to go to college, twins Jim and Mary Alice Salyers took their parents – and their little brother – to college with them (well, at least to the town where the college was). 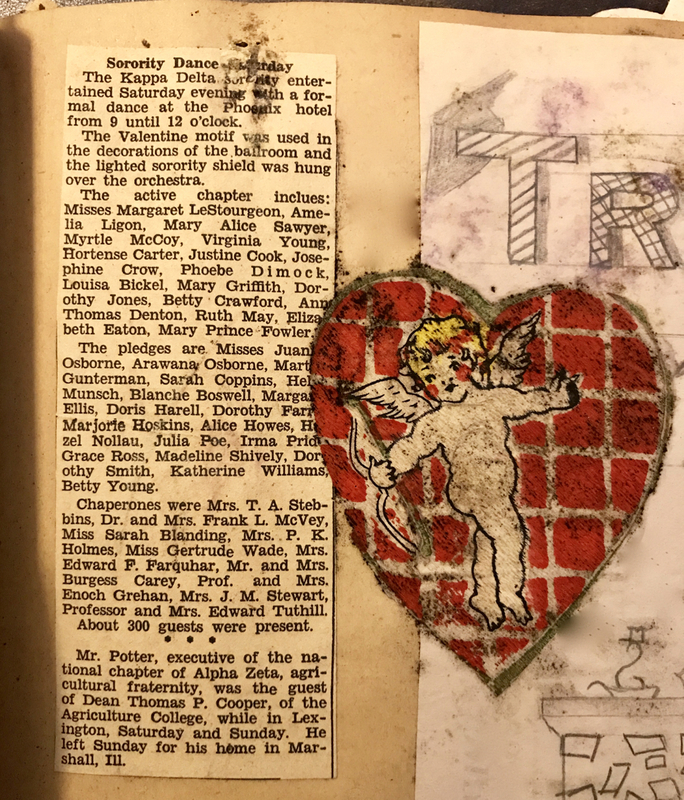 The scrapbooks for 1927-1929 had little to say about the family's time in Richmond, just a few pages of tidbits shared in last week's post. Suddenly, without preface or preamble, the scrapbooks show the family living in Lexington, and Jim and Mary Alice are enrolled as sophomores at the University of Kentucky. The whole household had once again picked up and moved! The "college years" scrapbooks are full of stories, letters, and photos about their life in Lexington and at UK. Let's start at the beginning of the 1929-1930 school year. Right off the bat, Mary Alice applied for a job on campus at the Margaret I. King Library. 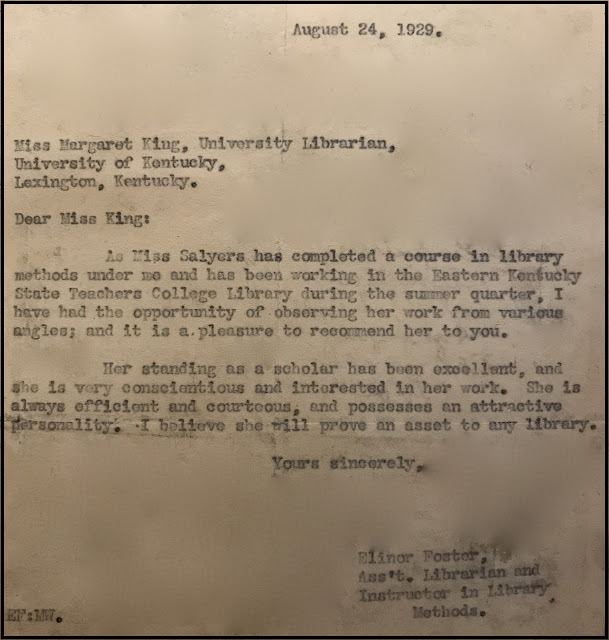 This letter of recommendation from her library science teacher at Eastern was a treat to find, because it includes both history and foreshadowing. Margaret King was UK's first librarian. The campus library named in her honor continues to be respected throughout the region. Mary Alice got the job and started working with Ms. King, and she eventually became a professional librarian herself. Jim also worked for various employers on campus and in town, mostly at jobs involving sales. Both Mary Alice and Jim participated in Greek rush. Jim was initiated into Kappa Sigma in the fall of 1929 with eight others, including another young man from Jim's home town of Carrollton, Kentucky. Mary Alice pledged Kappa Delta. 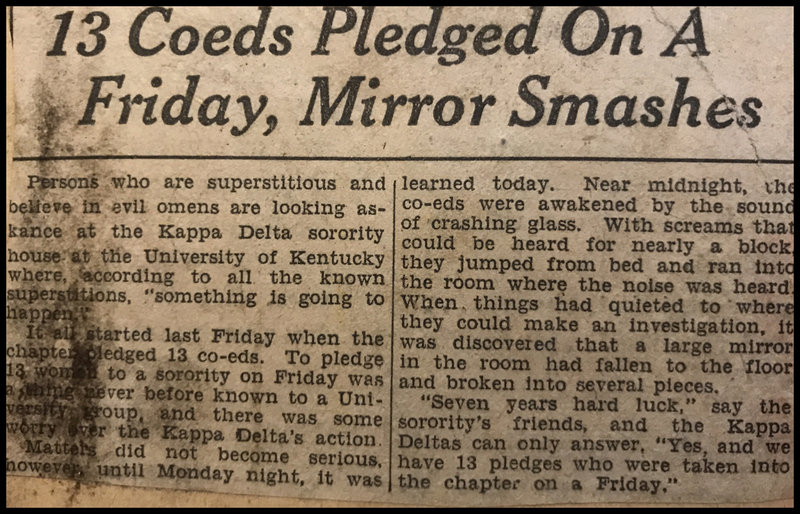 The sorority accepted 13 pledges on a Friday, a circumstance that, by superstition, caused an ominous start to Greek life for the pledge class. The story in this unsourced, undated clipping probably appeared in Kentucky Kernel, the UK student newspaper. Other items in the scrapbooks confirm that the year was 1929. 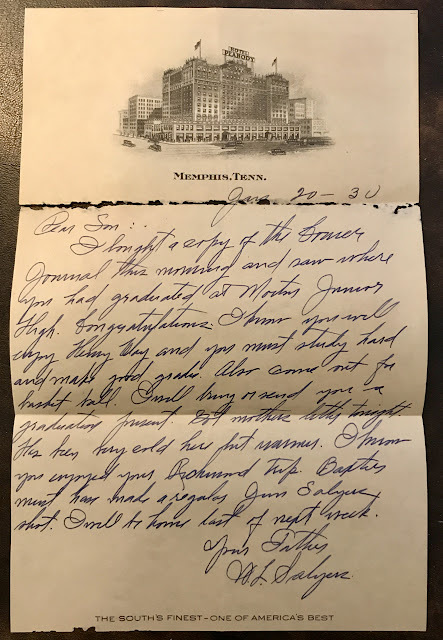 Big brother Bob, now a graduate of Eastern and the advertising manager for Moore Brothers Company in Illinois, supported his younger siblings in their quest for fraternity/sorority membership. This note to Bob, its sender unknown, indicates that Bob may have lobbied with the fraternity chapter's pledge master on Jim's behalf. Mary Alice, who had been considering several sororities, wrote to Bob a few times asking for advice. Once she settled on Kappa Delta, she informed him by telegram. 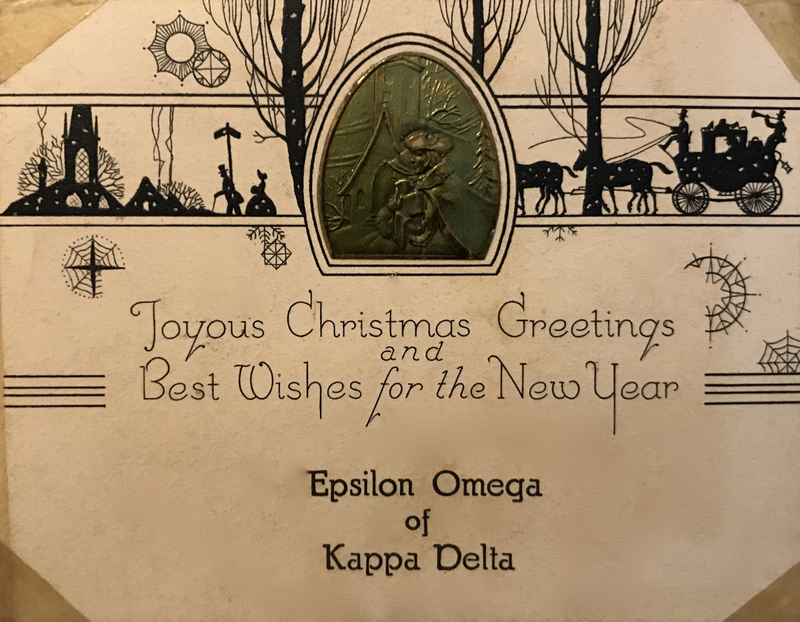 By December, both Mary Alice and Jim were sending Christmas cards emblazoned with Greek insignia. 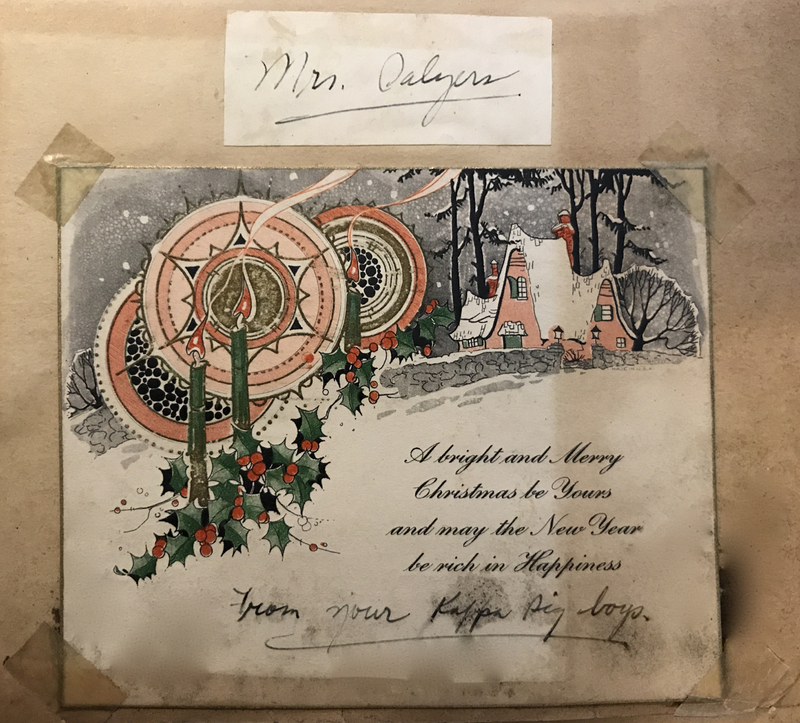 The following card indicates that mother Sarah Eva Howe Salyers, true to form, welcomed her children's fraternity and sorority friends into the Salyers home and became more or less a "mom" to those whose families lived far away. At least once she sent Jim to the fraternity house with a cake. 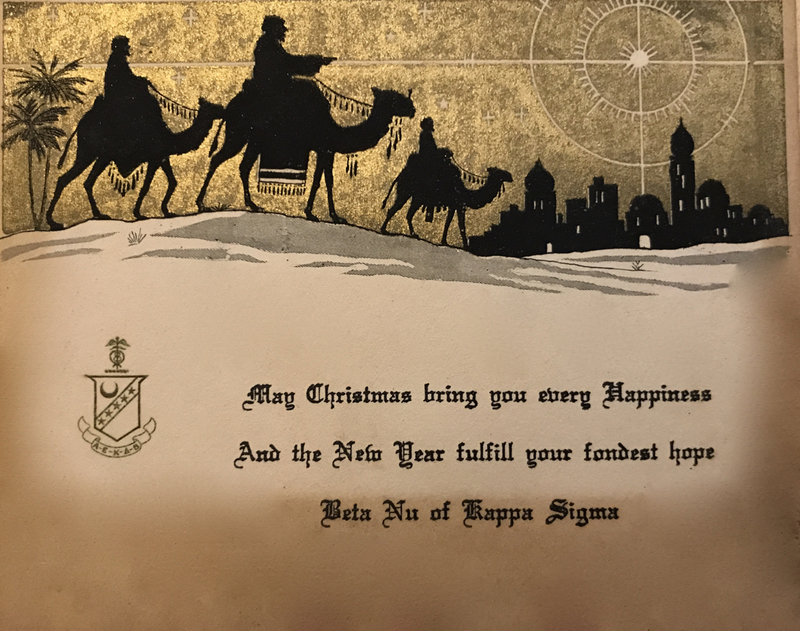 No wonder she got this card from her "Kappa Sig boys." 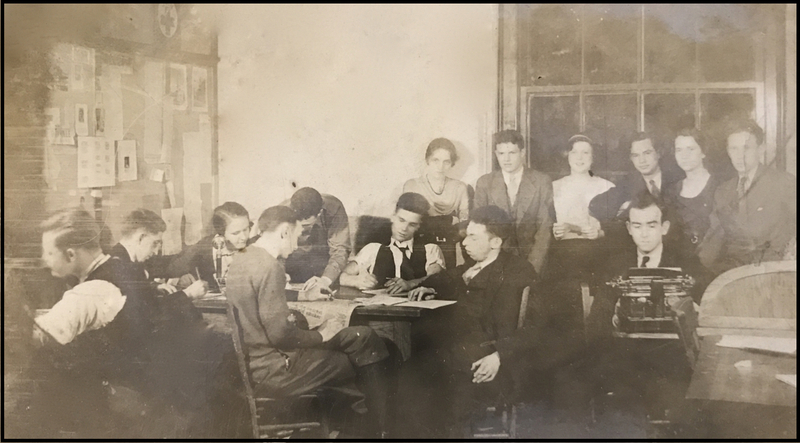 In the next image, Mary Alice (standing in front of the light-colored wall) is surrounded by others on the Kernel editorial staff. Most of the students look so serious! 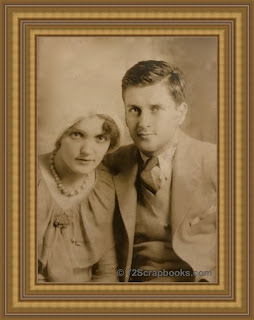 So began a busy student life for Jim and Mary Alice at the University of Kentucky. The scrapbooks are full of notes and letters, dance and party invitations, clippings about Greek events, and other mementos of college days the early 1930s. Stay tuned!